Chris calls upon the services of Joe Cooper (McConaughey) to kill his mother, but Chris and his father Ansel (Thomas Hayden Church) can’t pay Killer Joe upfront, which is one of the hitman’s non-negotiable requirements for providing his services. When the stone-cold killer gets a look at sweet little ol’ Dottie, though, he makes a deal with Chris and Ansel to take her as collateral for the job. Cooper and his willing, oblivious hostage develop an unusual, Natural Born Killers-esque bond. Things are going just fine until Joe and Ansel can’t pay Joe for killing their mother, and the retainer becomes his personal property. Based on the play by Pulitzer and Tony Award winner Tracy Letts, Killer Joe is a violent, provocative black comedy that examines the values of the American South in a no-holds-barred style. It’s been a fantastic year for McConaughey, who turned in memorable performances in Soderbergh’s Magic Mike and Richard Linklater’s Bernie, and finally takes the spotlight in Killer Joe with a fearless, nuanced portrayal. McConaughey’s Joe Cooper is a silver-tongued Southern gentleman with alarming sexual proclivities – all cool and collected on the surface, with a murderous, unstable interior but always confident, always in control of the situation. And while Friedkin’s film won’t be for everyone (deranged and nasty as it can be), McConaughey deserves recognition for his performance, as does Gina Gershon (who plays Chris’s stepmother, Sharla). 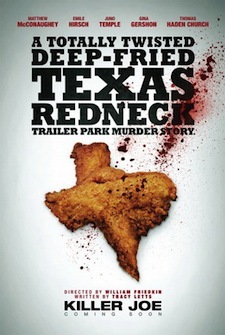 If anything, Killer Joe proves the Academy Award-winning William Friedkin is still a filmmaker with something to say. The man behind The Exorcist, The French Connection, and To Live and Die in L.A. hasn’t made many noteworthy films over the past 20 years, but Killer Joe signifies what could be the beginning of Friedkin’s second wind. Overall, Killer Joe isn’t for everyone. It’s exceedingly dark, macabre, and violent – sexually perverse – and shows human beings at their absolute worst and their most cold and calculated. It’s a bleak, ironic comedy with terrific performances, and for McConaughey’s character alone, it’s worth seeing.